There was a wonderful speech on immigration delivered by Senator Marco Rubio of Florida as the reform bill was being debated a few days ago. It was no surprise that politicians of all shades gathered round him after he had finished to congratulate him. In a country parched of bipartisan politicians, Rubio, the 42-year-old son of Cuban immigrants and a frequent Tea Party hero, stepped outside the party lines to support something special. He caught much flak from colleagues for doing so but he knew he had to stop the rot in the GOP over immigration. The party has lost the HIspanic vote and cannot secure the White House unless they win back a significant percentage. Rubio is the Republican front runner for 2016, a marvellously eloquent young man who could transform his party’s prospects. As an Hispanic, as a competent right wing senator but also as a compassionate conservative, Rubio ticks the box of future American superstars. Democrats knew that without Rubio’s support and cover it would be impossible to pass immigration reform in the senate. Just as John McCain had been the GOP bellwether on immigration in the past, now Rubio was that man. If he voted yes over a dozen Republicans knew they had cover. Rubio not only voted yes, he delivered a stemwinder of a speech that will go down in history as a possible turning point for the GOP. 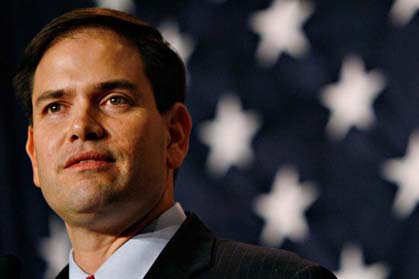 This man can hold Florida, win back Colorado and give the GOP an opportunity to hope again -- if they listen to him. That is no sure thing. The party has buried itself in divisive politics for so long now they may not know which way up is. It is the way Rubio is pointing to. “They have come because in the land of their birth, their dreams were bigger than their opportunities. Here they brought their language and their customs, their religions and their music, and somehow they’ve made them ours as well,” Rubio said. “Even with all our challenges, we remain that shining city on a hill. We are still the hope of the world. Go to our factories and our fields, go to the kitchens and construction sites, go to the cafeterias in this very capitol and there you will find that the miracle of America is still alive. For here in America those who once had no hope will give their kids the chance at a life they always wanted for themselves. When have we last heard such rhetoric in support of a decent cause? Certainly not from Obama. Folks, Marco Rubio is the real thing.